Biennial flowers take two years to grow from seed to flower before they die. Because many of them are self-propagating, they are sometimes mistaken for perennials. Usually it is best to start biennial seeds inside and move them outside after the danger of frost has passed. You can also purchase seedlings at your local nursery. Below are some examples of biennial flowers to enjoy in your garden. Angelica-this plant grows six to eight feet tall and is good as a background for other plants. The entire plant is edible and has a taste similar to licorice. Liven up your baking with the seeds or add the leaves to your salads. Even the roots are edible and can be used in soups. Umbels (a flat topped or rounded cluster of flowers with one stem) of white flowers look beautiful in the garden or in an arrangement on your dining room table. 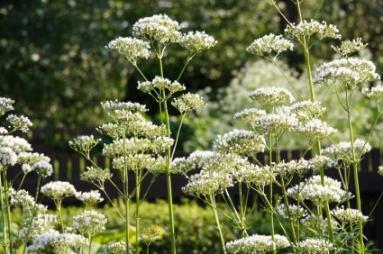 Caraway-grows around eight inches tall and produces pink or cream-white umbels. Along with its feathery leaves caraway makes a nice addition to your herb garden just as the seeds make a nice addition to your kitchen. Evening Primrose-another tall, background plant, the evening primrose grows four to five feet tall. Pretty lemon yellow or white flowers open in the early evening and close around mid day. But blooms are not the only contribution that they make to your garden; they also have a lovely scent. Foxglove-Definitely not an edible herb, this showy plant forms a rosette of leaves its first year. Spikes of bell-shaped flowers form the second year. 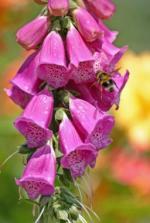 Growing one to two feet tall, the flowers of the wild foxglove range from deep purple to lilac. Cultivated varieties also come in yellow, white and rose colors. This plant is highly poisonous so keep out of areas where pets and children play. Black-Eyed Susan-perhaps one of the most popular of wildflowers, black-eyed Susan is easy to care for and often is included in wildflower seed mixes. Because they are drought resistant they flourish anywhere as long as they have full sun and well drained soil. Sweet William-may grow over two feet tall and produces bright, bi-colored flowers in shades of pink, red and purple with white edges. For garden decorations, they grow well in containers as well as in rock gardens. Their edible flowers have a clove-like scent and flavor and are a favorite of honey bees and gardeners alike. Wallflower-grows one to two feet high and prefers well drained soil and full sun. English varieties have flowers that are purple, white or pink. Siberian varieties flower in orange and yellow. Hollyhock-produces lots of pink, yellow, white or dark maroon flowers. There are about 60 varieties of this four to six foot tall plant so you are sure to find some that will fit into your garden plan. Pansy-a garden favorite, this flower is known for its face-like appearance and bright cheerful colors. The compact, nine inch tall plants are easily found in garden centers everywhere and will add a friendly face to your walkways and borders. Pansy comes in many colors with a dark center. A fanciful addition to your salad, the pansy has a light, mint-flavored flower that can also be candied or frozen into ice cubes for a pleasantly surprising addition to a summer drink. Queen Anne's Lace-a perfect addition to a butterfly garden, Queen Anne's lace is a wildflower that is found almost everywhere in the United States. Growing three to four feet tall, the flowers are usually white and sometimes pink. Excellent in poor soils, this biennial flower prefers full sun. 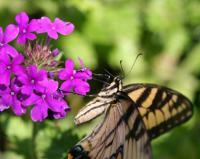 Verbena - is a hardy plant that grows from six inches to four feet high. Its multi-flowered clusters come in several colors including pink, white, purple, red and blue. Honey bees are attracted to verbena so adding this lovely flower to your garden will not only add color, but also help it to flourish. Even though they take a little time, growing biennial flowers in your garden is worth the effort. They will reward you with a beautiful garden and bring in necessary beneficial insects to help your garden grow naturally. Pick a few varieties that interest you and experience the joy of biennial flowers.